Plenty of TV shows leave the air with story threads hanging and questions unanswered, but few have done so in the fashion of Hey Arnold! An animated fixture on Nickelodeon during the late ’90s and early ’00s, the series about football-headed fourth-grader Arnold and his exploits in the big city jumped to the big screen in 2002, in the first of what were proposed as two feature-length adventures. A follow-up, Hey Arnold: The Jungle Movie, was set to solve one of the show’s biggest mysteries—the whereabouts of Arnold’s parents, who’d left their infant son in the care of his boarding-house-proprietor grandparents, then disappeared in the fictional Central American nation of San Lorenzo—before factors commercial and creative led to its cancellation. For more than a decade, The Jungle Movie lived on in fan speculation and interview queries; when Nickelodeon began exploring its back catalog for potential reboots and revivals, Bartlett was finally granted the chance to realize his long, lost vision. With Hey Arnold! : The Jungle Movie now set to debut on Nick this Friday, November 24, The A.V. 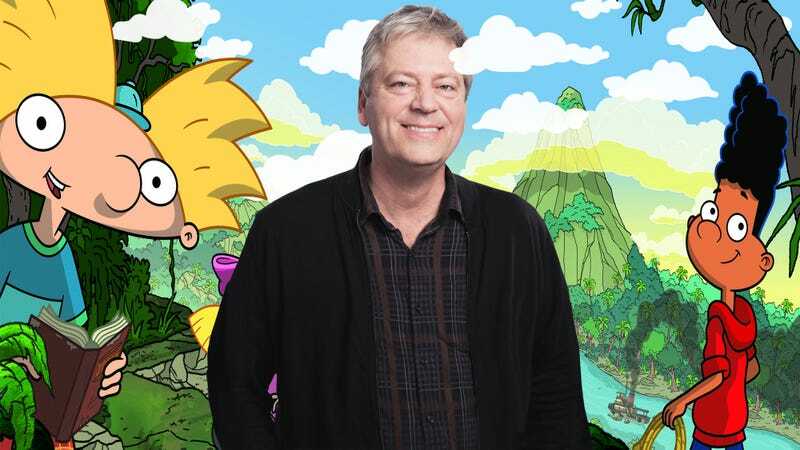 Club spoke with Bartlett about bringing Arnold and friends back to TV, the multi-generational talent that made The Jungle Movie possible, and the possibility of more Hey Arnold! in the future. The A.V. Club: A renewed interest in Hey Arnold! cropped up online around the beginning of the 2010s—was that around the time that you became aware of this fan base that wanted closure with Hey Arnold! and had sustained the conversation about The Jungle Movie? Or was it earlier than that? AVC: Did The Jungle Movie create the opportunity to do that? CB: Yeah. A really cool part of this story is that we were really encouraged by Nickelodeon to mix it up and not only bring back the O.G. Arnold artists and writers from the old days, but bring in the next generation, and I hired artists and writers who loved the show when they were kids. And I think that combination of old-school and new-school really energized the whole project. I can think of so many examples in the finished Jungle Movie of stuff that was done by the next generation. They really brought a lot to it, and it was their love of the show—the love of a kid who loved it as a kid and grew up. AVC: How did those two generations of creatives mesh? CB: Really well. A little bit more than two years ago, we spent a long, three-day session breaking the story, and then from there I wrote the outline for the two-hour movie. There were, in that group, a couple writers who had grown up on the show, and I had Michelle Lamoreaux and Joe Purdy—who had been writers on the series—and then just a couple other writer friends that I’d met in between. And so we had a really cool age range from about 30 to 50—there were a whole range of points-of-view and a range of ages. And I think it really helped, and we got along great. I remember there were times when Michelle and I were joking about some really obscure moment in the series—we’re big fans of Helga episodes and Olga episodes—and we’d been telling a little joke, and the next generation writers knew exactly what we were talking about. Nothing escaped them, their knowledge of the series was encyclopedic. AVC: You basically hired your own institutional knowledge. You know, the clip we showed at San Diego in July? That is so meta. The idea that Helga and Gerald make a video to win the contest so Arnold can go to San Lorenzo, and it’s about how Arnold’s always helping people? It’s basically what the series is, and so we showed in that three-minute clip, all these different examples that were from episodes of the series. And the gag that Helga had been surreptitiously video-taping his whole life: As you watch these clips, from scenes that you probably remember from the series, except the camera’s at a different angle, like now it’s up in a tree or behind a wall or under something. It comments on the series even as you watch a thing that’s hopefully entertaining and funny and good. AVC: It’s also an efficient method of catch-up for anyone who missed the original series. AVC: Many of the voice actors returned for The Jungle Movie—Dan Castellaneta, Tress MacNeille, Francesca Marie Smith, Anndi McAfee, to name a few—but you did have to cast some replacements. What was it about the actors that you chose for Arnold and Gerald that captured the essence of those characters? CB: Well, the Arnold character, you know we replaced over and over again, because we had to get a certain, before-puberty, husky, super-chill boy voice. And each of these kids turned into a teenager and their voice cracked and they just didn’t sound like Arnold anymore. And then Gerald is different: It’s such a unique style that Jamil Smith had in the first place, that we kept just trying to keep Jamil around and pitch his voice up. So I was really impressed when Benjamin Flores Jr. [who plays Gerald in the movie] came in—he clearly had watched many episodes and really absorbed the Geraldness. I was super-thrilled. The same thing went with the other characters: Stinky is such a unique-sounding kid, and I didn’t think that could be imitated—but somehow we did. Eugene, Curly, Sid—those were all the boys we had to bring in. And I just appreciated what a great job the next-generation actors did at mimicking those sounds. Some of them you can’t believe—when you listen to Curly and Eugene in The Jungle Movie, you’ll swear it was the originals. AVC: Alfred Molina is playing the villain of the piece, La Sombra. Was his casting a wink toward him being in Raiders Of The Lost Ark? CB: Everybody remembers that scene from Raiders. It’s really funny to, because when everybody meets him, you can tell he’s been asked these questions over and over. The Raiders guy, Doc Ock from Spider-Man 2—I’ve seen him in all kinds of dramatic roles, and I just knew he had the dramatic chops. And you’re not expecting the English accent when he comes in. AVC: He’s got such a quality of voice, too. CB: He’s a perfect guy for voice-over. I hope we find a way to reprise his role or write him a new one and keep working with him, because he’s fantastic. AVC: You say “reprise his role”—are you leaving the opportunity open for more Hey Arnold! after this? CB: I’ve been saying this all along: The movie’s been made to act perfectly as closure so that everybody feels satisfied that all of the storylines got wrapped up. And also, at the end of the movie, they’re starting sixth grade, so season six is also my hope. AVC: That’s a might big task to take on: An ending that’s also a beginning. CB: [Laughs.] Yeah, no kidding. I thought the challenge of making a story that both had complete closure and also left the door open for more stuff—well, that’s TV. TV’s like that. There’s always another season, or you hope there’s another season. AVC: If you hadn’t had this specific story to tell—the trip to the San Lorenzo, the search for Arnold’s parents—do you think you would’ve still wanted to revisit the series? CB: It’s so funny—I can’t separate the two. I’ve been thinking about this unfinished business of The Jungle Movie for 15 years, and so it’s really hard to picture it any other way. It’s funny too because that’s what was going on a few years ago at Nickelodeon. They were really looking at the ’90s properties and going, “Well, which of these would be able to be rebooted?” And as they looked at them, you know they were asking those kinds of questions. They were saying, “If we reboot this, will people think it was just a cash-grab? Just doing it because we can? And that’s not a good reason to reboot a show. We should leave well enough alone.” In my case, when I first came in and was talking to them, I’m like, “Oh yeah, I’ve got a Jungle Movie I need to make. I’ve got this cliffhanger that never got resolved. I’ve got millions of adult fans who were really mad that it got left in this cliffhanger. I would love to do a reboot.” So I just felt I was really lucky in that way. I had the perfect project for them. AVC: How did The Jungle Movie evolve from its original conception, and this idea you’d kept in the back of your mind while you were working on other projects, to the final product? CB: When I think about what we were trying to do 15 years ago, and what we ended up doing now, we really benefited from the passage of time. I feel like when we got this chance to do it, clearly the quality of broadcast TV had improved—we’ve got this hi-def, 16:9 big screen that you could show in a theater and it’d look great—I mean, compared to our first movie, which we made for TV and then we blew up to film, and it kind of suffered from that process. I know that if we put The Jungle Movie on a movie screen, it’d look terrific. We went, “We know we’re going to have to redesign everything because of this new higher-definition format—let’s change it a little bit, let’s make it that a year or so has passed, and that they’re in the fifth grade so that they can all be a year or so older. We can redesign everybody and making them [Laughs.] a little taller, adjust their outfits a little bit.” And I thought, “Fine, we’ll make it so the change doesn’t upset anybody, but you can tell that some time has passed.” We really benefited from that and the story benefited from it, too, because I’d had a decade to think about it, so when I went to write the movie again, I was able to take all the hopes and dreams of the fans into consideration. AVC: The Jungle Movie is the first of these Nick reboots to debut. What does it mean to you that Hey Arnold! was picked to lead that charge? CB: I was so happy. I got to tell you: When we were making the show here 20 years ago, I always felt like we were just one of many shows that were being made at Nickelodeon, and I didn’t think we were better or worse than any other show. And so, to be at this point in the history of the whole legacy of Nickelodeon, and have it held in such high esteem, is really great, really flattering. It makes me really happy about the work we did. We knew we were making a good show in the first place, but we didn’t realize it would be so beloved. So that’s nice.